Hydatid disease is a parasitic infection affecting the brain in about 2% of the cases. Brain involvement is most commonly observed in children. Here, we report a 13-year-old male patient who presented with headache, nausea, and vomiting. Before cranial computed tomography (CT) was performed, the patient had generalized epileptic seizures. He was disoriented, and had anisocoria with dilatation of the right pupilla. CT showed a cystic lesion of 10-cm diameter in the right temporoparietal region that had caused a shift of the midline structures to the contralateral side; an urgent operation was performed as there were signs of midbrain herniation. A 13-year-old male patient was admitted to the emergency department with headache, nausea, and vomiting. Neurologic examination revealed bilateral papilledema. Before cranial computed tomography (CT) was taken, the patient had generalized epileptic seizures. He was disoriented, and had anisocoria with dilatation of the right pupilla. His Glasgow Coma Scale value was 7 (E1 M5 V1). CT showed a solitary cystic lesion with a diameter of 10 cm, which was hypodense, sharply demarcated, without perifocal edema, and caused a shift of the midline structures to the contralateral side. The cyst was located in the right temporoparietal region [Figure 1]. Because of the midbrain herniation signs, urgent operative intervention via a large craniotomy was performed. Once the dura mater was opened, a linear corticotomy was made. After visualization of the cyst wall, 0.9% saline solution was used to dissect the hydatid cyst from the surrounding brain to facilitate cyst removal (Dowling method modified by Arana-Iniguez). Valsalva maneuver was also applied to facilitate the removal of the cyst. The patient's head was lowered to further ease the cyst removal by gravity. The hydatid cyst was removed without rupture. The dura was closed in a watertight fashion after filling the remaining cavity with 0.9% saline solution [Figure 2]. Postoperative thorax and abdominal CT revealed no other foci. Fifteen days after the operation, a left hemiparesis occurred and cranial CT scan revealed a brain compressing subdural hygroma [Figure 3]a; therefore, we inserted a subdural-peritoneal shunt. Based on cranial CT performed during follow-up, the subdural-peritoneal shunt was effective and no complaints were reported [Figure 3]b. The neurological examination was normal. In the same CT examination done for follow-up, we noted that the site from where the hydatid cyst was removed was flask-shaped, relaxed space, and filled with cerebrospinal fluid (CSF) [Figure 3]b. However, in the follow-up at the fourth month after intracranial operation, we saw a distended cyst that had replaced the flask and relaxed CSF-filled space from where the hydatid cyst was removed; interestingly, we noted a jet-flow with flow void effect as an influx. This appearance suggested that a one-way valve mechanism had developed that filled the space [Figure 4]. In [Figure 4], the jet-flow and flow void of the high-speed CSF can be easily observed. This setup demonstrates the one-way valve mechanism of CSF flow, which causes enlargement of the porencephalic cyst. The patient underwent a third surgical procedure, and fenestration of the cyst to the subdural space was performed. A postoperative follow-up cranial CT scan showed no signs of the porencephalic cyst [Figure 5]. Postoperative albendazole therapy was then applied for 4 months (10 mg/kg per day). The patient was discharged following normal neurological exams. Currently, the patient is healthy and attending school without any epileptic seizures. The growth rate of hydatid cysts in the brain has been variably reported at 1.5-10 cm per year. ,,,,, The following growth rates have been reported: Evliyaoglu et al. reported a growth rate of 1 cm/month by assessing repeated examinations; Kemaloglu et al. reported hydatid cyst growth rate as 4.5 cm in 6 months based on CT findings; Pasaoglu et al. reported the growth rate of an untreated cyst as 10 cm/year based on follow-up CT; Kalelioglu et al. reported a hydatid cyst growth rate of 5 cm/year based on follow-up CT scans; Vaquera et al. reported a growth rate of 1 cm/year; and Sierra et al. reported a growth rate of 5 cm/year. 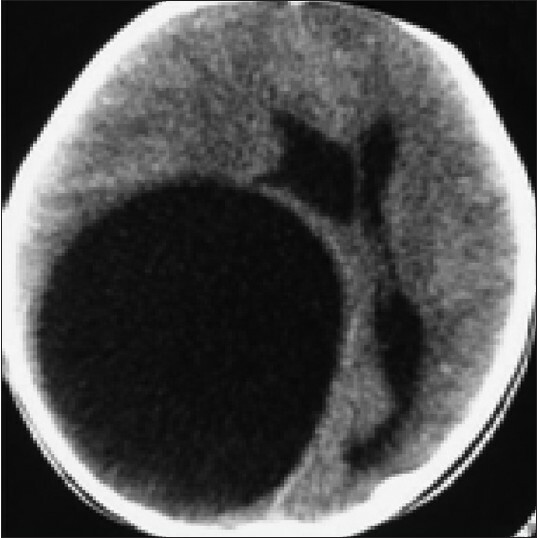 Patients with intracranial hydatid cysts usually present with features such as raised intracranial pressure due to the mass effect of the large-sized cyst. Focal neurologic deficits, such as hemiparesis, visual disturbances, ataxia, seizures, or other manifestations depending on the cyst location have been reported. Headache and vomiting are almost universally present along with bilateral papilledema. In our patient, headache, nausea, and vomiting were clinical symptoms and bilateral papilledema without neurologic deficits was present. The preoperative diagnosis is very important for surgical planning and a good prognosis. ,, A study using cranial CT showed fluid that was generally the same as the CSF without perilesional edema  ; however, Yis et al. reported perilesional edema,  which was also observed by Karak et al., around the cyst in the presence of active inflammation. A differential diagnosis of cerebral hydatid cysts on CT, as with arachnoid cyst, porencephalic cyst, neurocysticercosis, abscess, and pilocytic astrocytoma, has been reported. Calcification of the wall is present in approximately 1% of the cysts. Magnetic resonance imaging (MRI) typically shows a cystic lesion with a hypointense halo around the cyst capsule. The cyst is spherical, well defined, with thin regular margins. Ozkan et al. reported the usefulness of CT scans in the diagnosis of cerebral hydatid disease and in the planning of appropriate surgical management. We could not perform a cranial MRI prior to the operation due to the poor condition of the patient. The patient underwent an urgent operation and CT showed hypodense cystic lesion that was sharply demarcated and without perifocal edema and fluid identical to CSF. In emergencies, such as herniation in the presence of cystic lesions identified by CT, the possibility of hydatid cysts should be considered. Otherwise anaphylactic shock, chemical meningitis, or recurrence may occur due to the rupture of the hydatid cyst. ,,,, In literature review, we found two cases that received an urgent operation for a cerebral hydatid cyst. While Onal et al. treated successfully a 13-year-old girl by puncturing the cyst,  another patient died after operation. Our patient, who also received emergency surgery due to the rapid deterioration of his neurological status, was discharged after three operations following normal neurological exams. Intracranial hydatid cysts are usually solitary. However, 24 and 25 hydatid cysts have been reported in two different cases. , Intracranial hydatid cysts are classified as primary and secondary. The primary cysts are formed as a result of direct infestation of the larvae in the brain without the involvement of other organs. The secondary multiple cysts result spontaneously or from trauma or rupture during operation of the primary intracranial hydatid cyst. Our patient's thorax and abdominal CT showed no other foci for the hydatid disease. The main treatment for hydatid disease is complete removal of the cyst without rupture. The most commonly used surgical technique is the Dowling method modified by Arana-Iniguez. In addition, direct puncture and aspiration of the cyst fluid through a small hole in the cyst wall or expulsion of the cyst through a small cortical incision over the cyst using insufflation of air during contralateral ventricle techniques can be applied. A small number of reports showed complete disappearance of multiple intracranial hydatid cysts with albendazole therapy using a daily dose of 10 mg/kg taken three times a day for 4 months. In the literature, recurrence rates of 19% and a mortality of 10-12%, morbidity of 9.8%, and a preoperative mortality of 8.48% have been reported. When large cysts are removed in the pediatric population, subdural collections and porencephalic cysts have been reported. , Our patient received three operations for the treatment of hydatid cysts, subdural hygroma, and fenestration of the porencephalic cyst to subarachnoid space; subsequently, postoperative albendazole therapy was applied for 4 months (10 mg/kg per day). Hydatid cysts are known to enlarge slowly, rarely requiring emergency surgery. In case of emergencies, such as midbrain herniation and if cystic lesions identified by CT, the possibility of hydatid cysts should be considered where the infection is endemic. Irrespective of the preoperative diagnosis, if there is apprehension in the concrete diagnosis and suspicion of a possibility of a hydatid cyst through CT, we highly recommend the team to be prepared to remove a hydatid cyst without rupture. 1. Gupta S, Desai K, Goel A. Intracranial hydtid cyst: A report of five cases and review of literature. Neurol India 1999;47:214-7. 2. Ozkan U, Kemaloglu MS, Selçuki M. Gigantic intracranial mass of hydatid cyst. Childs Nerv Syst 2001;17:623-5. 3. Ýzci Y, Tüzün Y, Seçer HI, Gönül E. Cerebral hydatid cysts: Technique and pitfalls of surgical management. Neurosurg Focus 2008;24:E15. 4. Altinörs N, Bavbek M, Caner HH, Erdogan B. Central nervous system hydatidosis in Turkey: A cooperative study and literature survey analysis of 458 cases. J Neurosurg 2000;93:1-8. 5. Sreedhar M. Disseminated hydatid disease: A case report with MR spectroscopic correlation. Indian J Radiol Imaging 2006;16:771-4. 6. 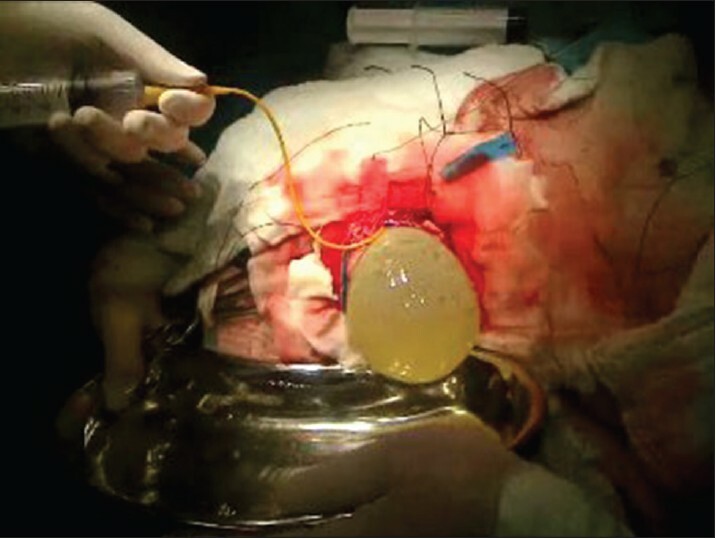 Guzel A, Tatli M, Maciaczyk J, Altinors N. Primary cerebral intraventricular hydatid cyst: A case report and review of the literature. J Child Neurol 2008;23:585-8. 7. Lunardi P, Missori P, Di Lorenzo N, Fortuna A. Cerebral hydatidosis in childhood: A retrospective survey with emphasis on long-term follow-up. Neurosurgery. 1991 Oct; 29 (4):515-7; discussion 517-8. 8. Kemaloðlu S, Ozkan U, Bükte Y, Acar M, Ceviz A. Growth rate of cerebral hydatid cyst, with a review of the literature. Childs Nerv Syst 2001;17:743-5. 9. Evliyaoglu C, Yuksel M, Gul B, Kaptanoglu E, Yaman M. Growth rate of multiple intracranial hydatid cysts assessed by CT from the time of embolisation. Neuroradiology 1998;40:387-9. 10. Müfit K, Nejat I, Mercan S, Ibrahim K, Mete UY, Yüksel K. Growth of multiple hydatid cysts evaluated by computed tomography. J Clin Neurosci 1998;5:215-7. 11. Paþaoðlu A, Orhon C, Akdemir H. Multiple primary hydatid cysts of the brain. Turk J Pediatr 1989;31:57-61. 12. Sierra J, Oviedo J, Berthier M, Leiguarda R. Growth rate of secondary hydatid cysts of the brain. Case report. J Neurosurg 1985;62:781-2. 13. Trivedi A, Shukla S, Singh K, Sharma V. Giant intracranial hydatid cyst. J Pediatr Neurosci 2007;2:72-4. 14. 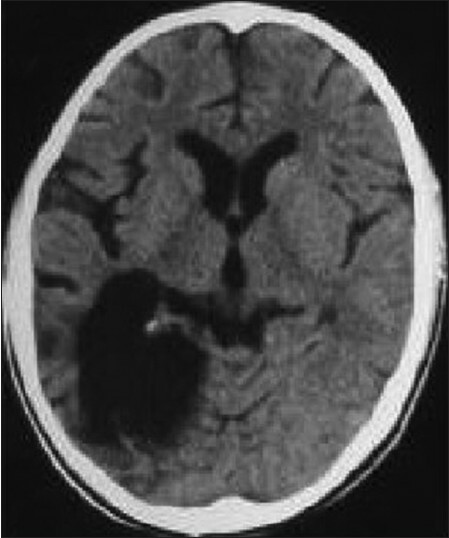 Vaquero J, Jiménez C, Martínez R. Growth rate of hydatid cysts evaluated by CT scanning after presumed cerebral hydatid embolism. Case report. J Neurosurg 1982;57:837-8. 15. Kamath SM, Mysorekar VV, Rao SG, Varma RG. Intraventricular hydatid cyst in a child. Indian J Pathol Microbiol 2009;52:571-2. 16. Onal C, Erguvan R. Gigantic intracranial mass of hydatid cyst. Childs Nerv Syst 2002;18:199-200. 17. Yis U, Uçar MD, Baºar N, Baþtemir M. Gigantic hydatid cyst of the brain. DEÜ Týp Fakültesi dergisi 2008;22:161-3. 18. Tüzün M, Altinörs N, Arda IS, Hekimoðlu B. Cerebral Hydatid disease CT and MR findings. Clin Imaging 2002;26:353-7. 19. 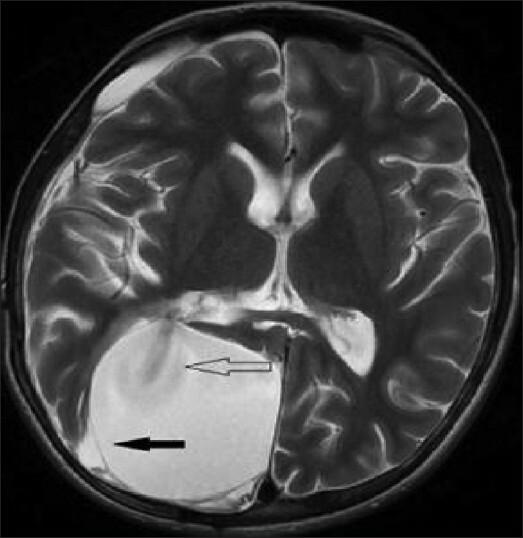 Güvenç G, Özdemir N, Yýldýrým L. Successful treatment of hydatid cyst into the lateral ventricle with dowling′s technique in an adult patient. J Neurol Sci (Turkish) 2011;28:265-9. 20. Karak PK, Mittal M, Bhatia S, Mukhopadhyay S, Berry M. Isolated cerebral hydatid cyst with pathognomonic CT sign. Neuroradiology 1992;34:9-10. 21. Tascu A, Ciurea AV, Vapor I, Iliescu A, Brehar F. Giant asymptomatic intracranial hydatid cyst in a 3 years old child-case report. Rom Neurosurg 2010;3:359-63. 22. Onal C, Barlas O, Orakdögen M, Hepgül K, Izgi N, Unal F. Three unusual cases of intracranial hydatid cyst in the pediatric age group. Pediatr Neurosurg 1997;26:208-13. 23. Cavuþoðlu H, Tuncer C, Ozdilmaç A, Aydin Y. Multiple intracranial hydatid cysts in a boy. Turk Neurosurg 2009;19:203-7. 24. Yurt A, Avci M, Selçuki M, Ozer F, Camlar M, Uçar K, et al. Multiple cerebral hydatid cysts. Report of a case with 24 pieces. Clin Neurol Neurosurg 2007;109:821-6.